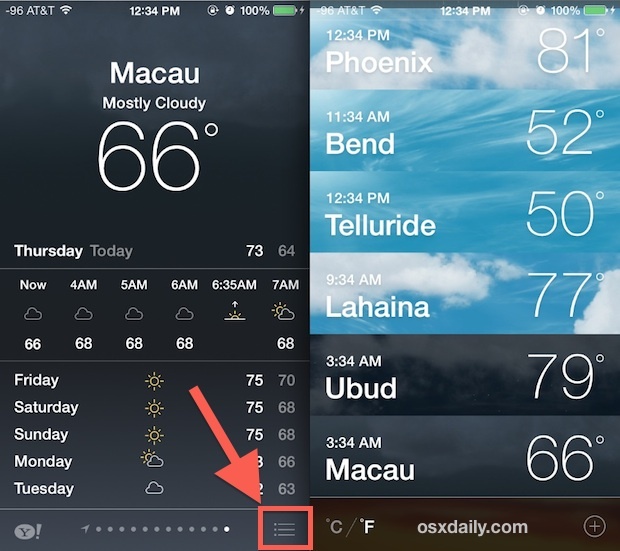 Want to see the weather for multiple locations at once on a single screen, without having to flip between locations in the Weather app of iPhone? This is simple on the iPhone since modern iOS updates, and with holidays, summer, or ski season approaching for the northern or southern hemisphere it should be an increasingly popular trick to use when planning trips through various climatic zones. What makes this particularly helpful is that the backgrounds shown behind the location and weather information will continue to update according to the time of day and conditions, providing a visual cue for what sort of elements to expect. Remember you can also add a new location for weather by tapping the (+) plus button and entering the name of a destination, location, city, or town. It’s also much easier to switch the default temperature views from fahrenheit to celsius and vice versa, just by tapping the “C / F” icon at the bottom. This no longer requires a settings toggle, but beyond location temperatures, general weather conversions are still best done with Siri. If you added a bunch of locations and you’re not thrilled with their placement, you can easily rearrange the weather list with a simple tap-and-hold trick. In list view, just tap on a location and then drag it up or down as desired. 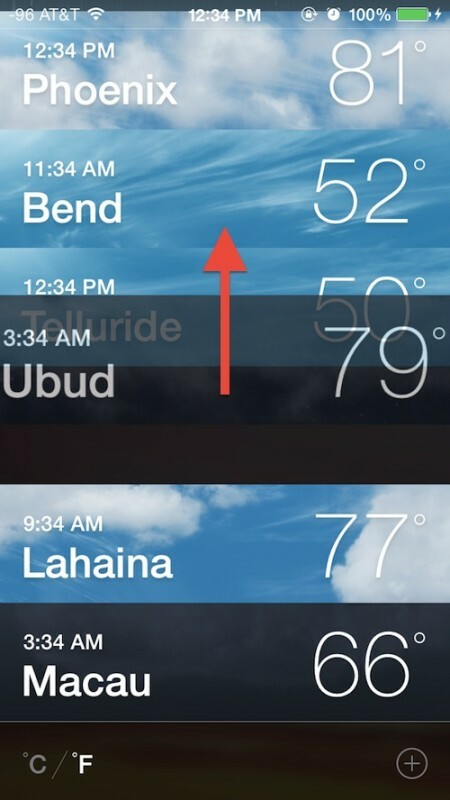 Rearranging in the list view also impacts the sequence when flipping through weather locations in the normal view. Overall, this is a simple trick, but seems to not be widely known. This seems pretty idiotic. It ONLY works on IOS 7 ON AN iPhone with a REAL narrow scene, NOT an iPad…. Idiotic. Why does the native weather app on iphone no longer show the suburbs of a city (in this case, Melbourne Australia) any more? Please enable suburb locations within a city again please? Try adding the specific zip postal code or town name, or be sure that Location is turned on for the Weather app so that it can get details from the location you are residing in.